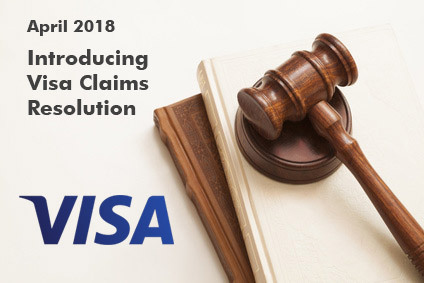 In this article we'll explore Visa's new dispute resolution process, which is replacing the old chargeback process, and is aptly titled "Visa Claims Resolution". This is not intended to be an official or authoritative resource on the topic of VCR. For that, you should refer to content provided on the Visa website which can be found here. What we'll be exploring here are some of the biggest changes, and the beneficial impact it will have on merchants. It's fair to say that some merchants find the chargeback process difficult to understand. It is a process that has a lot of mystery associated with it, simply because there is often little insight into what goes on behind the scenes after receiving a chargeback. Disputes come in, you try to fight the disputes, sometimes you are successful, and sometimes you are not. It appears simple (you just send in your information) and then you wait to see what happens. Many merchants would benefit by having a better technical understanding of what is occurring after the paperwork is supplied. Since VCR has new rules with regards to the resolution of disputes we'll touch on this along with some of the changes that are occurring behind the scenes. The VCR process is scheduled to be implemented on April 15, 2018. Even the terminology itself is getting an overhaul. Disputes will no longer be called "chargebacks", but are now called: "disputes". When you get your information together and try to fight the chargeback it used to be called "representment". Going forward, it's sensibly referred to as the "dispute response". How the Visa Claims Resolution (VCR) works. The process itself isn't changing that significantly. You still will be notified of disputes (chargebacks) and if you want to fight it you'll still provide information about the transaction to defend against the dispute. What's different is that the process is streamlined, faster, and if all goes as planned, you should have less chargebacks to deal with overall. Literally everyone wants less chargebacks because they are a pain for all involved. One of the major benefits of the VCR process is it will make life easier for merchants, processors and card issuers by reducing the overall number of disputes that occur. You should be able to spend more time running the business, and less time trying to handle disputes with customers. How does VCR reduce unfair disputes for merchants? Visa has introduced a system to filter out and block invalid disputes (things that would have been chargebacks in the past but were not fair and should not have occurred). One major complaint that we often get from merchants is where they've fully refunded a transaction, but a chargeback will still come through. This causes a lot of frustration for merchants. VCR addresses this problem directly, and once it goes into force it should no longer happen. If a transaction has been credited back, and if someone then tries to raise a dispute you'll never even know that someone tried to charge it back. VCR will detect the credit, rule the dispute as invalid, and prevent the dispute from continuing. Visa has introduced a system to filter out and block invalid disputes. It will reduce the number of disputes that occur. Shortening timeframes for faster responses. One of the goals with the new system is to speed up the timeline so disputes do not take as long to resolve. This is good in the sense that things will move faster for all parties, but also means merchants will have to be organized and faster to respond than in the past. The timeframe that a merchant actually has to respond within depends on how quickly the processor is able to notify the merchant of the dispute. Some processors, even until recently, offered mail (old fashioned snail mail) as the method to receive your chargeback notifications in. Going forward, this is just not going to be an option anymore. Snail mail notifications were never a good idea anyway, and none of our clients at Merchant-Accounts.ca are given the option of physical notifications. The faster you receive your notifications of disputes, the sooner you can start working on a compelling response to it. Visa has plans to further reduce the response timeframes in 2019 (cited from an excellent webinar by Ethoca about the changes associated with VCR, but the link has been removed and can no longer be referenced). The quality of your response is also far more important than in the past because the process is streamlined, shorter, and you have to put a perfect dispute response together on your first attempt, because you won't get a second chance. You've got one chance to make it count. Prior to VCR being implemented, when a chargeback occurred there could be several rounds of communication between a card issuer and the processor. What would happen is the merchant would provide their information regarding the order, the processor would provide it to the issuing bank, and then the issuing bank would have the opportunity to communicate back and forth in an additional round of communication to seek further information. Going forward there is only one single round of communication. You provide your information to the processor. The processor forwards this information to the issuing bank. At that point the issuer will either accept the information and rescind the dispute, or will stick to their guns and decide in the cardholders favor. There is no more back and forth. You make your case, and they make their decision from that one round of communication. Want to win? Be concise. Be compelling. Visa has a guideline for providing compelling information when trying to overturn a chargeback or win a dispute. Since you only have one round of communication you have to get it right the first time. If you are not going to fight the dispute it's best to respond and simply concede the dispute. You won't win without strong evidence in your favor, which will be discussed in a further topic we plan to post in the coming weeks titled "How to win chargebacks". All is lost? Not quite! Take it to Visa for arbitration. There are times, such as for merchants that sell high-end products or services and do large tickets, that you are not okay with losing a dispute. Actually, for clarity, pretty much all merchants are never okay with losing a dispute. What I mean to say is that sometimes the amounts in dispute are very large, and in these cases, if you feel the card issuer got it wrong, you can take it to Visa for arbitration. Arbitration is good in the sense that Visa will weigh all the evidence as a neutral third party and will render a decision. Visa has the power to overturn the card issuing banks decision on a dispute. The reason merchants should not do this haphazardly is because taking a dispute to arbitration is expensive. The fee for arbitration in April 2018 will be $500. The losing party will pay the arbitration fee, and whatever amount owing for the order. If you are selling a $100 item it probably isn't worth taking the chance to lose $500 on top of the $100 that has already been lost (unless you have extremely compelling evidence). However, if you have a very high ticket item, for example you sell high end luxury travel, and you can definitively prove that this person showed up and used the service, this would be a good candidate to take a dispute for arbitration with Visa. Understanding the reason for the disputes will be easier. For example, where an attempted transaction reported no authorization, but the card was actually charged. For example, incorrect amount charged to the customers card. For example, Incorrect currency charged to the customers card. For example, if the customer claims the merchandise was not received. For example, if an item is received but not as described or is defective. Interestingly, you can see from a lot of the above reason codes that many of these issues could be avoided with good customer service. The Visa VCR process is an improvement, but it's still a heck of a lot better to prevent a dispute from occurring in the first place. If you have an upset customer do what it takes to make them happy. It is never good when a customer is so frustrated that they go to their bank to open a dispute. When the dispute reason is provided to you it should simplified and easier to understand, and easier to build a targeted response if you are going to try to overturn the dispute. Another efficiency of VCR is that merchants can bundle their information to address a number of transactions in a single response. For example, if a merchant were to get a bunch of chargebacks from a single customer they can address them all one shot. This could be where a merchant sells monthly access to a website, and after six months of use the cardholder tries to claim it all back in a dispute. The merchant could provide access of the IP addresses used to access the content, and whatever other evidence they want to submit in a bundled response to reduce the amount of time and effort spent collating information. Tighter rules for card issuers. Although not all the changes are on the payment processing side and won't necessarily directly impact merchants, there are other changes that may have a trickle down effect in one way or another on merchants. For example, one of the things that is changing is that if an issuer processes a claim of fraud for a cardholder, but then doesn't cancel the card, then Visa will prevent the issuer from initiating any other fraud disputes for any new transactions on that card that occur after the date when the fraud was reported. It's not expected to have a significant effect on merchants, but the rules are changing for both processors and card issuers, and there could be some small ripple effects in ways that are yet to be discovered. Merchants are going to find VCR to be a positive move in the right direction. Other than shortening the timeframes in which merchants must respond to disputes (which some merchants may struggle with), it's pretty much good news across the board with the main takeaway being that less disputes are going to occur overall. If you have any questions about chargebacks and dispute resolution, VCR, or any other e-commerce related issues don't hesitate to contact us. You might also want to check out an older but still very accurate article about how to win chargeback disputes.